Velkommen to meine laboratory for der FrankenjeepTM. 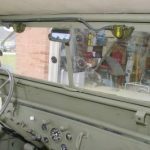 These pages cover zee recent rebuild of der FrankenjeepTM, with namen der Frankie. Heh, heh, danke to der crew at der G503 for that ein. It’s possible it vas meant as ein insult but meine skin and Frankies’ hide (being 16 and 18 gauge) are just too thick. So here ve are running mit it! 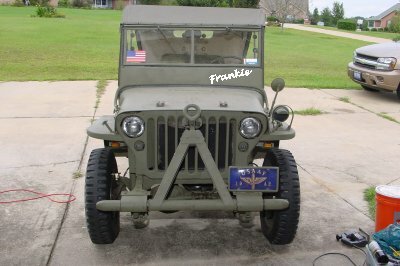 Herr Doktor BobN Above, front view of jeep, sporting tow bar and 48 star flag. Gone are the civvy tires. Frankie still uses civilian rims but now they are 4.5×16’s with NDT!. Frankie is done mechanically. The only thing that remains are some minor painting of the organization numbers, name (that’s just a trick of my art software) and a few other things. 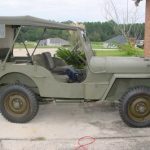 At left, side view of jeep. Notice how scary Frankie is, none of the jeep police come over to our castle to play. Why those NDTs are the envy of my rockcrawlin’ buddies (tho’ technically there aren’t any rocks to climb over in Florida — just mud and sand). Maybe you can make out that non-standard turn signal stick. That’s a holdover from North Dakota and Alaska where it was just too cold to stick your hand out to signal! What is that evil looking white spot on the dash just above the steering column? Gone is the gas can. 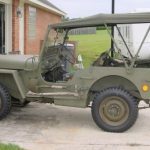 Early jeeps did not come from the factory with a gas can holder. They were often fitted in the field but not on this one as yet. There will be a USA registration number painted just above the Ford script. But what is that? Turn signal indicators, how sinister. And they are so small (LEDs). 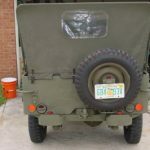 Over on the spare tire, a license plate holder co-designed with help from Jon Rogers of JeepDraw which also has a second brake light and license plate illuminator. What IS that?! There are THREE sticks on the floor. Boohaha, just one of the secret and strange fitments to FrankenjeepTM fitted by Herr Doktor BobN. Another interior shot showing the three sticks, turn signal. The white knob is as yet an unpainted switch for the WW2 crew compartment heater from the March 1944 Winterization Kit. The red sticker is the instruction plate for the overdrive. Yep, FrankenjeepTM is equipped with a speed enabling device. The switch on the toe board on the passenger side is to eliminate all power from Frankie in cases of emergency or just when Herr Doktor decides to shut der monster down. As yet the rifle rack has not been refitted but the mounts are present. In this shot you can make out those rockcrawling specials known as vacuum wipers! Boy, would Bubba like to have those. You can also the essential rockcrawling feature, a center mounted rear view mirror. Essential to see your way when reversing down large rocks. Of course this is not a problem for Herr Doktor as this doesn’t exist around his neck of Florida. 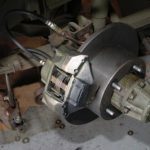 Also visible are the mounting disks for the electric defrosters from the March 1944 Winterization kit an obvious rockcrawling accessory that needs no further explanation. 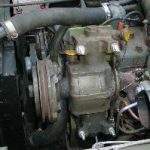 A T-1 Air Compressor was installed by Herr Doktor to handle those large 6.00×16 NDTs. You can never have too much air, you know, when you are rockcrawling. One of Frankenjeep’sTM most sinister implants by Herr Doktor–Meine Gott it has such huge Scheibenbremse. “Oh, how I sing the sweet mysteries of life”-apologies to Mel Brooks. 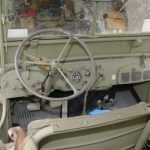 Why would anyone want working brakes on a WW2 vehicle that is driven in daily traffic? Yep, you guessed it…Rockcrawling. So far Frankie has only been through a brief training exercise and the performance was admirable…no pulling left or right…fully straight ahead. 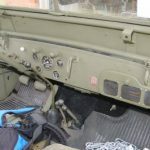 All seriousness aside, if your are der new intern mit your jeep, you should not attempt to perform der procedures until completion of your studies and know zee ramifications. You can expect to visted by zee village idiot, nein, nein, der village zealot and of course zee jeep polizie. But fear not meine Damen und Herren, der FrankenjeepTM vill not be subjugated.